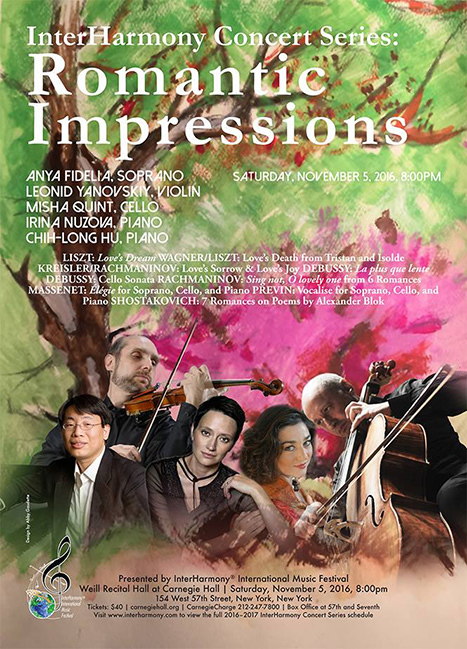 On Saturday, November 4th at 8PM master cellist and Founder of InterHarmony® International Music Festival Misha Quint will perform with brilliant colleagues and young artists in a gorgeous program of 18th and 19th century music he has curated to open the 5th Anniversary InterHarmony® Concert Series at Carnegie’s Weill Recital Hall. Mirrors are essential for knowing ourselves, the mirrors of the mind the most important; the best mirror is music to show us who we are, and of that the Romantic to expose the depths of our psyche, our worst fears, our greatest joys. Tickets are $40 and can be purchased by calling CarnegieCharge at 212-247-7800, at at www.carnegiehall.com, or at the box office on 57th and 7th Ave. This concert is shaped with tempestuous changes of mood that coalesce to a transcendence of ardor and mystery. The terror of Liszt's bombast gives way to the delights of a Schubert chestnut, naïve yet of exquisite sophistication that has its own moments of darkness. An unassuming though perfect gem of an obscure song will introduce a famous aria of anguish. Salon pyrotechnics on the violin will meet the patrician warmth of Beethoven, and Brahms will own the rest of the evening, first with tranquility, then concluding with a youthful masterpiece, grand. Brahms' B-Major Trio, written when the composer was only twenty, overflows with the best of human feeling, through the four movements first of warmth to unbounded passion, Prussian impishness that explodes to paroxysms, a quiet intimacy of feelings of near silent holiness, topped with an unsettled mystery, in the minor, a wandering one, ending with thunderbolts. Olga Kaler, violin, Misha Quint, cello, John Owings, piano - What a way to conclude this whirlwind night of such myriad facets of The Romantic! Praised by critics for her “deep, soulful sound” and “powerful and enchanting renditions” OLGA DUBOSSARSKAYA KALER toured three continents as a soloist, chamber and orchestral musician. Currently a violin professor at DePaul University School of Music in Chicago, Kaler is chosen to join the distinguished violin faculty of the Cleveland Institute of Music in the fall of 2018. Kaler holds Doctoral degree from the Northwestern University. Her previous degrees are from the New England Conservatory of Boston, the Moscow State Conservatory and the Stolyarsky Special Music School in Odessa. Kaler was awarded the Special Prize at the Rodolfo Lipitzer International Competition in Italy, and the First Prizes at both the Northwestern and Thaviu-Isaacs Competitions. Currently a member of the World Orchestra for Peace under the direction of Valery Gergiev, the Chautauqua Symphony Orchestra of NY and the Chicago Ensemble, she appeared at InterHarmony International Music Festival in Italy, the Bowdoin International Music Festival in Brunswick, ME, and music festivals in Sarasota, FL, Skaneateles, NY, Montreal, CA, Steamboat Springs, CO, Athens, Greece, Villa Musica and Schleswig-Holstein Festivals in Germany. Kaler performed at the world’s legendary concert venues, including Carnegie Hall, Moscow Conservatory Great Hall, Royal Albert Hall, and the Berlin Philharmonie. Described as "THE BOOK" and "the Bible for Violinists" by the leading US pedagogues, Dr. Kaler’s Scale System for Reluctant Scale Enthusiasts met with enthusiastic reception from string players around the world. She is currently in preparing the violaand cello versions of the book. The Scale System is adapted into curriculums of conservatories around the world, along with Kaler’s acclaimed method book, An Effective Method for Teaching and Studying Violin Technique. Praised for his exciting pianism and sensitive artistry, pianist JOHN OWINGS versatile career has ranged from solo and chamber music recitals to concerto appearances in major cities in the United States, Latin America, Europe, and Asia. His critically acclaimed CD recordings include piano music by Samuel Barber, Aaron Copland, Elliott Carter, Robert Casadesus, and Julius Reubke, as well as chamber music by Eric Ewazen, Richard Lavenda, Quincy Porter, and Elena Sokolowski. A native of San Antonio, Mr. Owings received his formal training at the University of Texas, The Royal College of Music in London, and The Juilliard School, where his teachers were Rosina Lhevinne and Martin Canin. His other teachers have included Dalies Frantz, Géza Anda, and Wilhelm Kempff. Gold medalist of the Robert Casadesus International Piano Competition in Cleveland, Mr. Owings also won the Vianna da Motta International Competition in Lisbon, the London Liszt Society Competition, and the Musical Arts Competition in Chicago. An experienced chamber music performer, Mr. Owings enjoys collaborating with many distinguished musicians. He is a member of Trio Con Brio – an ensemble that has commissioned and premiered new works by over a dozen living composers. A dedicated teacher, Mr. Owings’ students have won national and international competitions and have successful careers as performers and educators. He has given master classes in the United States, England, Italy, Colombia, Peru, China, and Japan, and has been a guest artist at InterHarmony, MusicFest Perugia, Bucaramanga, the Round Top Festival, and PianoTexas International Academy and Festival. John Owings is Professor of Music and Chair of the Piano Division at Texas Christian University where he received the school’s highest honor – the Chancellor’s Award – in recognition of his performances of the 32 Beethoven Piano Sonatas. 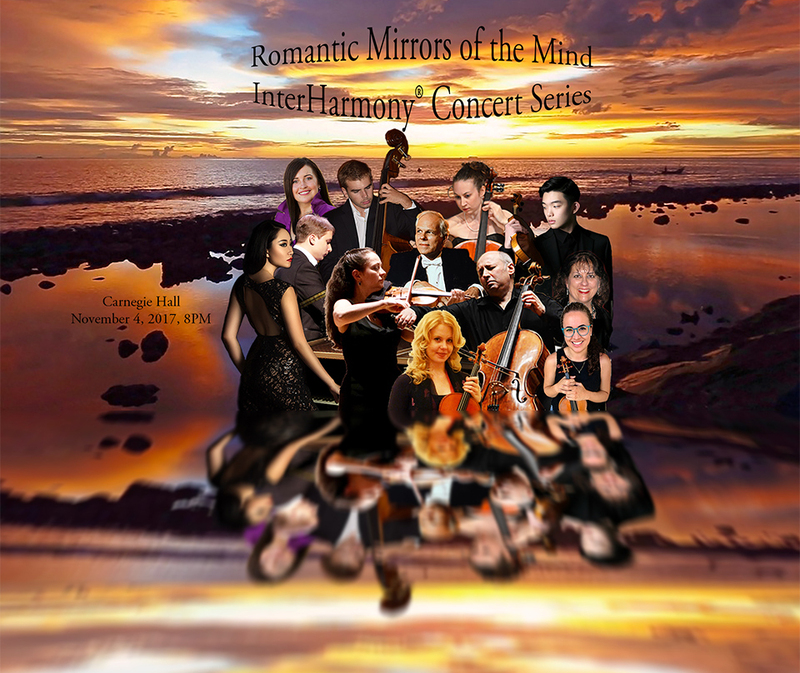 Six sonatas from these live performances have been issued on a CD recording. Pianist DELANA THOMSEN is a highly accomplished solo and collaborative pianist who has given recitals throughout Europe and the US, as well as Master Classes in Iceland, Bulgaria, and the InterHarmony Festival in Italy. In NYC she has appeared numerous venues including Alice Tully Hall and Weill Hall. Ms. Thomsen has been affiliated with Aspen, Juilliard and Mannes. She has been pianist for the violin classes of Ivan Galamian and for Master Classes of Dorothy Delay, Shirley Givens, Jean-Pierre Rampal, Eleanor Lawrence, Channing Robbins, Alan Harris, Leonard Rose and Mstislav Rostropovitch. “Morgunbildith” in Iceland wrote "artistic...a first-rate musician (who) projects unusually loveable playing"; The "Borba" in Bulgaria wrote "Ms. Thomsen plays with an authentic and sensitive style that gives the listener a sound picture of the boundless nuances of human life"; and “The Music Connoisseur” wrote “…the appealing duo displayed a high level of virtuosity throughout”. She is a sought after teacher and inspiring mentor, and her pupils have had great recognition. Several have had the honor of being chosen to perform in Master Classes with distinguished artists such as Jerome Lowenthal, Edna Golandsky, and Robert MacDonald. Ms.,Thomsen’s pupils have been the winners of numerous local & concerto competitions including Yonkers Philharmonic, Long Island Youth Orchestra, LaGuardia High School, & Hudson Valley Music Club. She is on the piano faculties of Manhattan School of Music Precollege, Hoff-Barthelson Music School and has private teaching studios in NYC and Columbia Co. NY. Her teachers have been Ruth Slenczynska, Arthur Balsam, Dalmo Carra as well as 13 years of post-graduate studies with Elizabeth Moschetti Tobias: assistant to Dorothy Taubman. Born in San Juan, Puerto Rico, violinist HOSANNA CARELLA began her musical endeavors at the age of 6 as part of the Suzuki Program at the Puerto Rico Conservatory. She studied with Marta Hernandez, Mayra Urdaz and Francisco Caban-Vales, while also being part of the Orchestral Program of the Conservatory as Concertmistress. While in the program, she was named winner of the Concerto Competition in 2010 and 1st prize of ‘The Symphonic Experience Competition’ hosted by the Puerto Rico Symphonic Orchestra, where she made her debut in Centro de Bellas Artes in 2011. 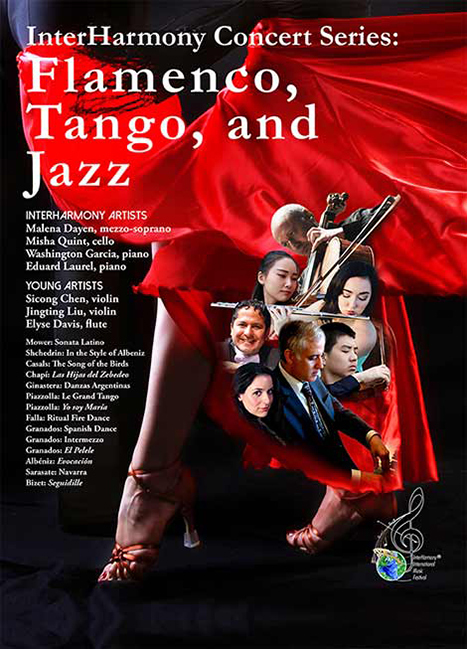 As a recipient of grants from the Edna Gomez Foundation and the Berrios Foundation ‘Young Artist’ grant, Ms. Carella was able to continue her studies with Mimi Zweig and Stephen Clapp, of the Juilliard School, before receiving Scholarship to commence her Undergrad studies at the Cleveland Institute of Music with Joan Kwuon. During her undergrad, Ms. Carella has served as Principal and Concertmaster of the CIM orchestra, also in Severance Hall, and was part of the Advanced Piano Trio Program directed by Sharon Robinson. She has participated in festivals such as Credo Chamber Music, Cambridge International String Academy, Colorado College Music Festival and Bowdoin International Chamber Music Festival. This summer she participated at IntherHarmony® International Music Festival and Sulzbach-Rosenberg International Music Festival, where she served as Concertmaster and collaborated with Vadim Repin, Misha Quint and Nikolaj Znaider. Ms. Carella has also collaborated with Jaime Laredo, William Preucil, Ani Kavafian, Anita Pontremoli, The Juilliard Quartet, Ying Quartet, among others. Presently, by a generous scholarship from the Cleveland Institute of Music, Ms. Carella is pursuing her Masters Degree under the tutelage of Jan Sloman. Pianist REXA HAN was born in China. As a child prodigy she made her hometown debut at the age of five. During her teenage years she won important national competitions and played throughout China to enormous acclaim. She attended the Central conservatory in Beijing and came to the United States with full scholarship to the Manhattan school of music. She graduated with the highest honers, wining the president’s award as well as the coveted Munz scholarship. As a concert pianist, she has given solo recitals in Europe, Asia, South America and across the United State. she has performed at Carnegie hall, the Grace Rainey Rogers auditorium at the Metropolitan Museum of Art, and recently as a guest artist at Het Concertgebouw in Amsterdam Netherlands. Ms. Han has frequently appeared on radio stations such as New York City’s celebrated WQXR, WWFM.org and WFMT.com in Chicago and on Chinese Television. She was also interviewed by various magazines including Fanfare. In 2011, she won First Prize in the 62nd Kosciuszko Chopin Competition in New York City. In 2012 she received an “Extraordinary Ability” green card from the Government of the United States based on the recommendation of Van Cliburn. Rexa Han’s new CD “ A Tribute To The Piano” has been released on the Elmaleh Collection vec. 102 which has been critically acclaimed. She makes her home in New York City. Double bassist MATTHEW HICKS is a senior high school student in Rockville, MD. He first picked up a bass in 6th grade, with the encouragement of his music department teacher, Scott Herman. He has studied under several private teachers, but for the past 4 years Matthew has benefited from the focused tutelage of Lynn Fleming. With Ms. Fleming’s support, Mr. John Leonard has coached Matthew in jazz performance methods and theory for the past two years as well. He is principle bassist in the Philharmonic Orchestra of the Maryland Classic Youth Orchestra (MCYO). Since the age of eleven, he has played for the MCYO, the Potomac Valley Youth Orchestra, and County and State Honors Orchestras. Matthew tells his family and friends “I couldn’t imagine any experience more fulfilling than studying and playing with the talented musicians at InterHarmony® International Music Festival in Acqui Terme, Italy this past summer – until now!” Matthew is humbled by receiving yet another once-in-a-lifetime opportunity playing again with such talented musicians in the InterHarmony® Concert Series at Carnegie Hall. Though he is still in the application process, Matthew is looking forward to college and having yet another chance to play music in another new and exciting environment. Violinist JEONG YOON KIM, a native Korean, began playing the violin at the age of eight. At the age of twelve, Jeong Yoon Kim would go on to make his debut at the Youngsan Art Hall with Mostly Philharmonic Orchestra. While he attended elementary school, Jeong Yoon was awarded 1st Prize of Music Education News Concours as well as placing silver in the Yaejin Music Competition. Through this endeavor, Jeong Yoon played various winners’ concerts. Jeong Yoon would go on to enter the Yewon School and Seoul Arts High School which rank as the leading schools for music education in Korea. During his studies he won several competitions including the Strad Concours, the Eumyoun Competition and Sungjung Music Competition. Of note, Jeong Yoon won the 1st Prize of the Ewha and Kyunghyang Concours, which is the one of the most respected music competitions in Korea. He has concertized with Seoul Chamber Ensemble at the Seoul Arts Center as well as playing solo at Young Musicians Festival. During his high school years, Jeong Yoon would later go on to win awards at several more competitions including: Shinye Music Competition, Vienna International Music Concours, Haneum Music Competition, Universal Concours, Lyum Chamber Concours, Yeum SEA Concours, and the Hansei Univ. & Kukmin-ilbo Concours. Jeong Yoon went on to win 1st prize at the Seoul Arts School Concours and later performed with Seoul Arts School Symphony Orchestra Subscription Concert at Seoul Arts Center, acting as the representative of senior students. Jeong Yoon Kim has played in masterclasses taught by some of the world’s leading musicians including Philippe Quint, Boris Kuschnir, and Sergey Kravchenka among others. Currently Jeong Yoon is pursuing his bachelor's degree at Yonsei University under the guidance of Professor Youngmi Cho. His other mentors include Kwangkun Kim and Jane Kim. Jeong Yoon has since played a concert with Yonsei Sinfonietta as a rising star with promising potential. Recently, Jeong Yoon has given several concerts as the representative of his class in the university, including the Young Concert, Yonsei Chapel Concert for New Students, and the Kukje Academy Concert Festival. In 2017, he joined InterHarmony® International Music Festival (Germany, Sulzbach-Rosenberg International Music Festival, SRIMF) and performed a solo piece as part of the outstanding students and chamber music lessons given by Misha Quint. Cellist CAITLIN QUINN McCONNELL winner of the Pennsylvania, Regional, and National divisions of the National Federation of Music Clubs Collegiate Competitions, captured the Gladys W. Fisher Violoncello Award, the PFMC Award, the Harvey Gaul Award recognizing artistic potential, Agnes Fowler/Marie V. Thiesen Award and the Lawrence Foster Violoncello Award and was featured in the NFMC special publication. Ms. McConnell was also winner of an Assistanceship to Duquesne University for their Masters program under the tutelage of New York Soloist Misha Quint, the Tuesday Musical Club Scholarship Competition in May of 2008, Opus I Music Club Scholarship in April of 2008, and a prizewinner in the Music Teacher's National Association Young Artists Competition in 2007. 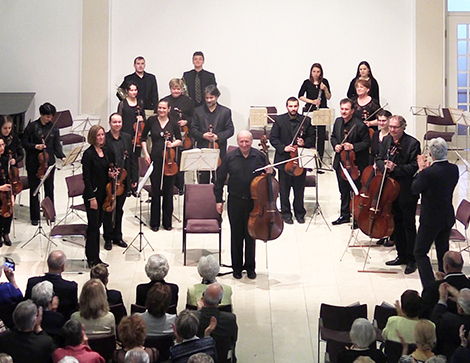 Critics wrote that she "shone on the cello with wholehearted devotion and rich expression", in a performance of the Dvorak Cello Concerto in Sulzbach-Rosenberg, Germany in August of 2011. Ms. McConnell has performed extensively in the United States, Holland, Italy, Romania, and Germany, and at such prestigious festivals as the Soesterberg International Music Festival in Holland, and InterHarmony International Music Festival in The Berkshires, MA, San Francisco, CA, Hinterzarten, Germany, and Sulzbach-Rosenberg, Germany, where she was featured on German television, and recently at Carnegie Hall in New York City. She recently performed Tchaikvosky’s Souvenir de Florence with Nikolaj Znaider, Boris Kuschnir, Eugenia Petrova, Tomas Krejbich and Misha Quint in Germany in August 2017. Violist AMBER REED received her Bachelor of Music in Viola Performance from the University of Arizona in Tucson, Arizona in 2013 and Masters of Music in Viola Performance in progress at Temple University, Philadelphia, Pennsylvania in 2015. Ms. Reed began her studies on violin at an early age. After studying violin for 10 years, she made the switch to viola and never looked back! She performs nationally, with an upcoming perfomance in Carnegie Hall May 7, 2015 and internationally--most recently returning to perform in Italy at the Interharmony International Music Festival. She has studied as well as performed in Shanghai, Beijing and many other cities across China. Ms. Reed is also an active performer in International Competitions worldwide, most recently visiting the Isle of Man, UK for the Lionel Tertis International Viola Competition to compete as a finalist for their 2013 competition (this is one of the two international competitions in the world for viola!). Ms. Reed is currently a graduate student at Temple University studying Viola Performance. Her principle teachers include international viola soloist, Hong Mei Xiao and Kerri Ryan of the Philadelphia Orchestra. Ms. Reed also enjoys a career as a freelance musician and private teacher of the violin and viola. She has actively taught for nearly a decade and currently maintains a private studio of twenty plus students. Other interests in no particular order include ancient history, philosophy, astronomy, Earth science, veganism, quantum physics, traveling, spirituality, anything interesting and following her heart always. Pianist VICTOR SHLYAKHTENKO, 15, is a student of Teresa de Jong Pombo at the Colburn Community School of Performing Arts in Los Angeles. An accomplished pianist, Victor recently performed at the Walt Disney Concert Hall as a Grand Prize Winner of the Music Center’s Spotlight competition. He received 1st place and a Special Prize in the 2016 Los Angeles International Liszt Competition and was an invited performer at the annual Liszt Society Festival at Northwestern University. Victor’s other recent honors include 1st places at the MTNA California Junior Piano Competition and the MTNA California Junior Composition Competition, the Robert Turner Piano Concerto Competition, and the Orange County Young Musicians Concerto Competition. 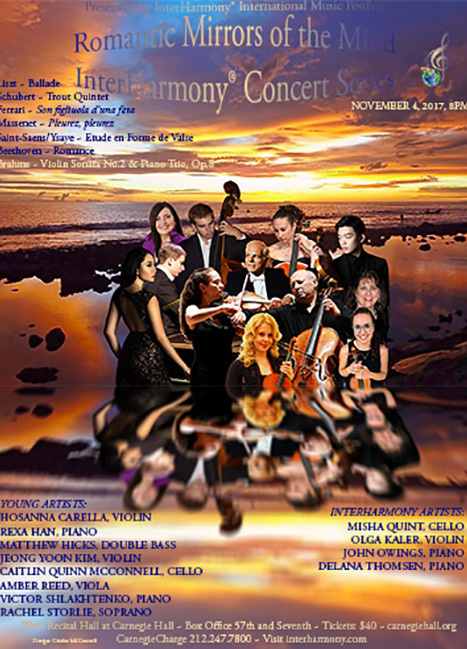 Victor has appeared as soloist with the Orange County Symphony, the LA Doctors Symphony, the Boulder Chamber Orchestra, the Orchestra Collective of Orange County, as well as the Colburn Youth Orchestra and Colburn Concert Choir, performing concerti by Mendelssohn, Chopin, Grieg, and Beethoven’s Choral Fantasy. Victor is passionate about community engagement and is a founding member of California Young Musicians, a network of avid young performers who enjoy sharing their art through concerts and lecture series. Victor has played in master classes taught by James Bonn, Bruno Canino, John McCarthy, Andrew Park, Andrew Parr, John Perry, Jean-Bernard Pommier, and Jean-Yves Thibaudet. Victor was an active participant in the InterHarmony® International Music Festival (2016) and Acqui Terme (2017), where he studied piano and violin, as well as played in the orchestra and several chamber ensembles. Victor has been awarded the 2016-17 and 2017-18 scholarships from the Chopin Foundation of the U.S. He is a recipient of the Richard D. Colburn Scholarship at the Colburn School. RACHEL STORLIE is a soprano who hails from Spring Grove, MN. She is a 2010 graduate of Luther College and recently completed her Master of Music in Vocal Performance at the University of Northern Iowa from the studio of Dr. Jean McDonald. Recent recitals have featured works by Alban Berg, Désiré Pâque, Edvard Grieg, Agathe Backer-Grøndahl, and Ned Rorem. 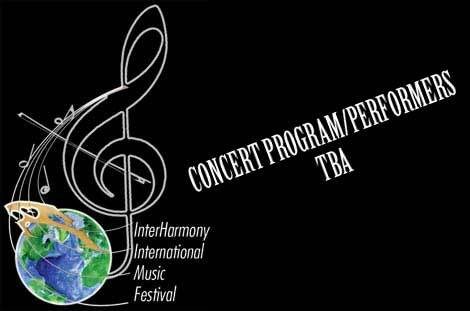 Storlie recently sang in performances of the Interharmony® International summer chamber music festival in Acqui Terme, Italy under the direction of Mitra Sadeghpour and Leonid Yanovskiy. Storlie's operatic repertoire includes La Princesse (L'Enfants et les sortilèges), Susannah (Carlyle Floyd), Contessa (Le Nozze di Figaro), Rosalinda (Die Fledermaus), Lauretta (Gianni Schicchi), Abbess (Suor Angelica), and Adriana Lecouvreur, Mimì, Fiordiligi, Chimène, and The Marschallin (scenes). She is currently working on the one-woman, one-act opera “La voix humaine” by Francis Poulenc. Storlie enjoys musical research and performance of obscure vocal literature, and in 2015 was awarded a research grant pertaining to Belgian composer Désiré Pâque at the Royal Conservatory in Liège. She also contributed to and presented at the 2016 Midwest Regional National Association of Teachers of Singing (NATS) conference the research project "Redefining Success: A Singer and Teacher's Guide." Storlie currently teaches voice at Luther College in Decorah, IA as an Alumni Guest Lecturer in Music, and fondly recalls her undergraduate performances with the Luther College Orchestra as a Concerto Contest finalist and soprano soloist for the Brahms Requiem. Tickets for all three performances are $40, and can be purchased by calling CarnegieCharge at 212- 247-7800; at the Carnegie Hall box office located at West 57th and Seventh Avenue or online at www.carnegiehall.org. 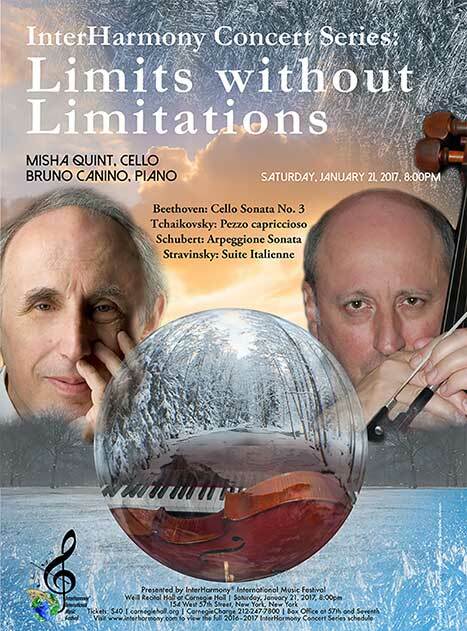 Cellist Misha Quint performs a program of contrasts: J.S. Bach’s Cello Suite No.6, a series of baroque dances referred by Rostropovich as a “symphony for the cello” and originally intended for a 5-stringed instrument, Robert Schumann’s imaginative 5 Pieces in a Folk Style that illustrate Goethe’s poetic story-telling and popular romantic songs, and the “Adagio” written by Clara Schumann’s half-brother, Bargiel.